Once relegated to second-grade status after ceasing to be the capital of the erstwhile CP and Berar Province, Nagpur is on the upswing. What started with a controversial 1.5-km modern flyover in the busiest Sitabuldi area of the city some ten years ago, is now fast shaping up into a hurricane of development. At the centre of it all is a Rs 3,000-crore Multimodal International Hub Airport at Nagpur (MIHAN) that will feed a Rs 10,000-crore Special Economic Zone. IT leaders like Satyam, L&T Infocity and Shapoorji Pallonji have already bought over 250 acres in MIHAN’s proposed SEZ. Tata Consultancy Services (TCS) and General Electric teams too are visiting soon. About 1,500 of the required 3,500 hectares have already been acquired for MIHAN. An international school is coming up soon, an ultramodern airport with a capacity to handle 10,000 people has been envisaged and a 100-MW captive power plant is set to come up. But the real booster came recently when Boeing chose it for its proposed about Rs 500-crore Maintenance, Repairs and Overhaul (MRO) facility. For a city that carried the tag of backwardness for many decades, Boeing meant a giant leap, literally. Already, Container Corporation of India’s inland depot at Nagpur is the fastest -rowing inland port in the country. ‘‘After the Boeing announcement, I have been flooded with inquiries from all over the world. TNT, Europe’s transport giant, have approached us to explore the possibility of setting up their base,’’ says Sinha. What goes in Nagpur’s favour is its central location—over 400 international flights pass daily over its skies, making Nagpur Air Traffic Control (ATR) the busiest in the country. Moreover, it is at the confluence of two major National Highways Kanyakumari-Varanasi (no 7) and Hawrah-Dhule (no 6) and all east-west and north-south railway lines. Sorry to revive this old thread, but as I promised you Nagpur's "Empress City" will look the business. Last edited by Suncity; December 13th, 2007 at 03:55 AM. Hospitality majors such as Taj, Oberoi and Orchid have begun preliminary investigative surveys here wanting to assess the tourist and business potential of the region. They have contacted the Nagpur Municipal Corporation (NMC) while examining the city's infrastructure and the cost of locating star properties or budget hotels within the city municipal limits. This foray comes on the heels of hotels here reporting a good summer rush and launching various schemes for retaining customers. Food festivals, happy hours and cuts on room tariff for regular customers are in vogue. There are only five prime contenders for the top slot in the hotel industry of this city of near 2.5 million. ITC Ltd, which has a full-fledged double storied branch office here for its ITD products, Life Style, food and agro divisions, is also learnt to have enquired about purchasing some existing properties. Nagpur Municipal Commissioner Lokesh Chandra confirmed that several chains including Taj, Oberoi and Orchid had made preliminary enquiries about land available with the municipal corporation for setting up their respective properties. Piramyd Retail, the Piramal Group promoted company, plans to open about 10 TruMart stores in the region. The Mumbai-based Kamat Group is planning to start three projects in Nagpur at an investment of Rs 130 crore. The group, known for its chain of ecotel properties under Orchid brand, will come up with a catering college, a three star hotel and a convention centre. “Land for the projects has already been acquired. The catering college will be located near Chhatrapati Square while the hotel and convention centre will be near the Airport on Wardha Road,” said Virendra Khare, whose architecture firm has bagged the contract for the catering college and three star hotel. The catering college will cover an area of 1.5 acre and be completed in phases. Nagpur has two other institutes offering courses in catering technology. These are the Tirpude College of Catering and the Tuli Group’s Catering College. Kamat’s catering college will also have a “trial hotel” and two museums. One will be on the theme of ‘enviroscope’ – displaying products made out of waste – while the other will feature regular antiques. The convention centre is the most ambitious project of the group and would cover an area of 50 acre. The Group plans to invest Rs 100 crore in this project alone. The convention centre is being planned on the lines of the group’s South Africa centre. Apart from the normal facilities of a usual convention centre, it will also feature eco-friendly five star facilities. The two projects are expected to take over an year to be completed. The three star hotel will take another three to four years. NAGPUR, July 24: Cricket is becoming a big money game and the Vidarbha Cricket Association, which manages cricketing affairs in this region, is not complaining. The cash rich VCA is going in for a second stadium of its own and will soon be the only association in the country to achieve this distinction. Construction work for a new Rs 55-crore ultra-modern stadium is in full swing at a 33-acre land at Jamtha, 16 km from the city on the Nagpur-Hyderabad national highway. The VCA has a 74 years glorious history behind it. Its existing stadium in the heart of Nagpur has been the venue of over seven Test matches starting in 1969 with India-New Zealand event. Much before that, during 1932 to 1936 unofficial matches with visiting Ceylon and England teams were played here before a decade-long slump caused by World War II upto 1946. With experience of staging two World Cup matches (1987, 1996), VCA is front-runner as venue for 2011 World Cup that India is hosting. "It will be the first stadium in the country to have full chairs for its 50,000 seating capacity. No one will be required to sit on concrete benches as we are providing colourful chairs in all the stands," VCA president Shashank Manohar claimed. The new VCA stadium will reportedly also be the first in India with full roofing. When the ground-breaking ceremony took place on October 9, the cost estimated is Rs 41 crore. But the association was quick to respond and sense new opportunities. "We have good chances of being given more than one of the 22 World Cup matches that will be played in India," said Rajan Nair, media in-charge of VCA. Looking to the World Cup opportunity and also the recent BCCI nod given to the Twenty20 matches, the VCA is hopeful of a rise in enthusiasm for the game. This has prompted the VCA to upgrade their plans for the new stadium further. Now instead of partial roofing, all stands will now get roofing. Floodlights have also been added and playing as well as spectator facilities will get more attention and money. While the BCCI will contribute Rs 25 crore, the VCA is sitting on about Rs 20 crore of its own. The rest will be raised through some 30 air-conditioned corporate boxes and advertisement revenue. Other salient features will be 10 practice pitches outside the ground, better dressing room facilities, gym and physio room. The media box will be big enough to accommodate 200 reporters with latest communication modes. First thing that simply captivates your heart about the CMD of Kamat Hotels Pvt. Ltd. and the man who has written the success saga of Orchids Hotels, is-- his inherent simplicity. Yes, Vithal Kamat, despite his awesome success, remains a man firmly rooted--to his traditional values and Indian ethos. And yet, this multi-linguist who knows more than 12 languages has been responsible for kick-starting quite a few revolutions. Whether it was birth of Asia’s first certified environmentally sensitive five star hotel or the concept of zero garbage hotels--Vithal Kamat has created historical landmarks, one after the other. The man is on a passionate mission these days! The hospitality baron is having a rollicking, scintillating affair with the Orange City. And how! Ask him whether that is the only reason why Kamat Group has decided to invest Rs 100 crores in a catering and Hotel Management College, a museum, a five star hotel, a two star, quite a few Kamat restaurants and an economy hotel? What would be the face of Nagpur in the next five years, according to him? When is the first Kamat project likely to come up? ‘Informed sources’ reveal that this is merely the tip of the ice-berg. The Kamat Group is planning to take the city by storm, in more ways than one. The talks are on about the group acquiring HP dealership for more than 50 pumps. And also a mega project (most probably a 7-star or an amusement park) worth Rs 150 crores is in the pipe-line. At this rate, the city can do no wrong. Nagpur’s leading architect Virendra Khare, the man who is responsible for architectural magnum opus like Piramyd and Landmark, is handling some of the important projects of Kamat Group, including the catering college, the museum and the comfort hotel. Kamat Group has already acquired 43,000 sq. ft. land at Chhatrapati Nagar, Gawande Layout. The catering college, a trial hotel and the museum will be built here. There will be 60 rooms, 2 laboratories and 6 classrooms built here. The building itself will cost around Rs 12 crores. Interiors, air-conditioning and other frills to cost extra. 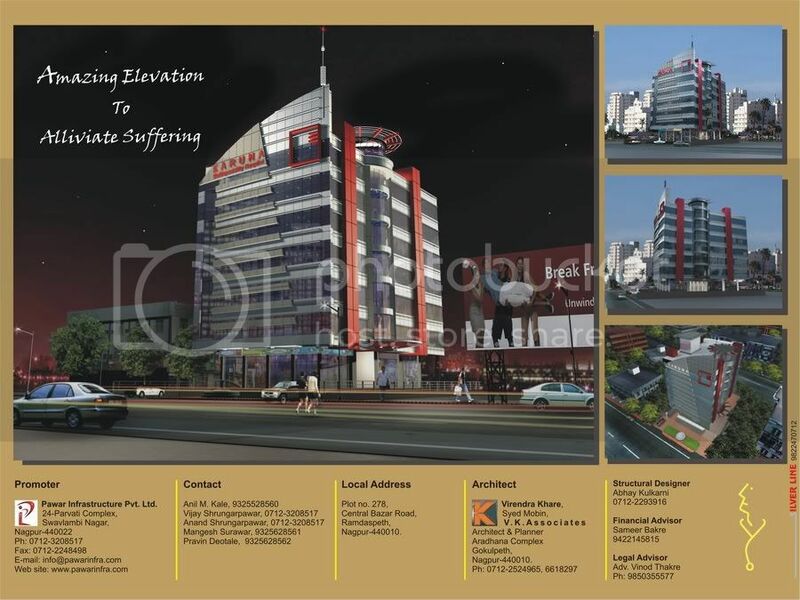 VK Associates, the architectural consultancy firm of Nagpur, to handle some of the key Kamat Group projects. Most of these projects to be completed in the next five years. Plans are on about acquiring HP dealerships. A mega project worth Rs 150 crores in the pipe-line. What is it they say about windfall happening all around! And that too, after a drought of sorts! Nagpur seems to have become the dream destination of almost all the multinational hospitality groups, all of a sudden. The latest to join the bandwagon is the Radisson Group, which is known for some of the classiest and chic properties all over the world. According to reliable sources, the group is coming out with a posh five-star hotel which will be a hospitality landmark, with a built-up area of 2.5 lakh sq ft. Needless to say, it will come with at least four theme- restaurants, a swimming pool, banquet halls, health clubs, gym, pool-side coffee shops...the works! There will be 160 rooms in the hotel, with each room costing around Rs 40 lakhs. This 80 crore project, is expected to be the ultimate thing in luxury with minimum room rent being Rs 10,000 per day! The project is a franchisee of the Radisson Group. Delhi-based builder Dharmendra Bhandari of Bestech India Pvt. Ltd fame, is the man at the helm of the affairs. Nagpur has some more reason to celebrate the arrival of the new player. Sources claim that V K Associates, the architectural consultancy firm, headed by Virendra Khare will be providing complete architectural and technical support for the project. Although when contacted, the city architect refused to comment. The basic plans are being done by Singapore-based Arc Designers, while the interiors will be done by Austria-based team of Radisson Group. The hotel to have 160 rooms with a built-up area of 2.5 lakh sq ft.
Mumbai, Aug 29: Boeing co will invest USD 118 million to set up a maintenance, repair and overhaul (MRO) facility in Maharashtra as part of the US aerospace firm`s India commitments, following the Rs 35,000 crore deal with Air India. The venture, to be set up near Nagpur will serve as MRO facility to the Boeing family of airplanes for the entire South East Asia. "The MRO will be set up in 25-50 acres of land belonging to the Airports Authority of India...AAI will transfer the land to Maharashtra Airport Development Authority, which is developing an international cargo hub in Nagpur," a top government official said. Boeing had received proposals from six Indian states including, West Bengal and Karnataka for the facility. "Boeing requested their centre should be near the air strip in Nagpur. The MRO facility has been finalised by the industrial department of state government during Chief Minister Vilasrao Deshmukh`s visit to Boeing head quarters in Chicago," the official said. While announcing its largest ever deal for purchase of 68 aircraft with Air India, Boeing said it will set up the MRO facility in the country, besides offset deal worth Rs 8,500 crore, enabling the Indian firms to participate in aircraft development programme. Maharashtra government has already cleared the international passenger and cargo hub project. Maharashtra Airport Development Corporation will hold 51 per cent stake in the venture while rest will be owned by airport authority of India. An Elevation to Elleviate Sufferings ! Last edited by Jai; August 31st, 2006 at 06:37 AM. The proposal of the Nagpur Municipal Corporation (NMC) to construct shopping malls on surplus lands has received a tremendous response with leading developers submitting their bids. The civic body has earmarked six places in the city for setting up shopping malls, hotels and restaurants. NMC has set aside over 63,090 square metres of land for the purpose at places like Netaji market, Sitabuldi (9,393.4 sq m), water works office, Gokulpeth market, West High Court road (9,304 sq m), Danaganj, Old Bhandara road (16,875 sq m), Jaripatka bus stop (5,983 sq m) and Pachpaoli and Kamal Talkies square (17,244 sq m). As per the plan, the corporation will not be spending any amount on the construction of its new offices, but will still earn a substantial amount as rent for the next two decades. 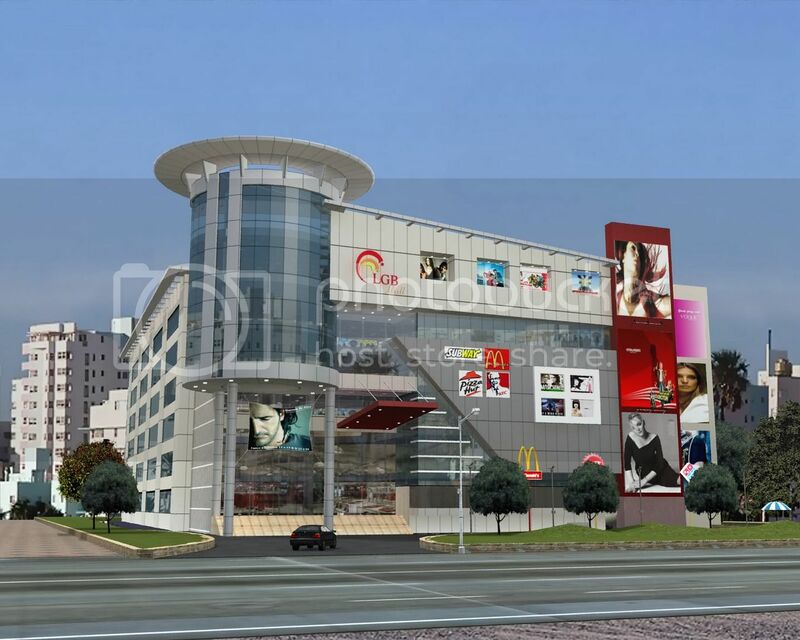 The malls will be constructed on a built-operate-and-transfer (BOT) basis at an estimated cost of Rs 203 crore. 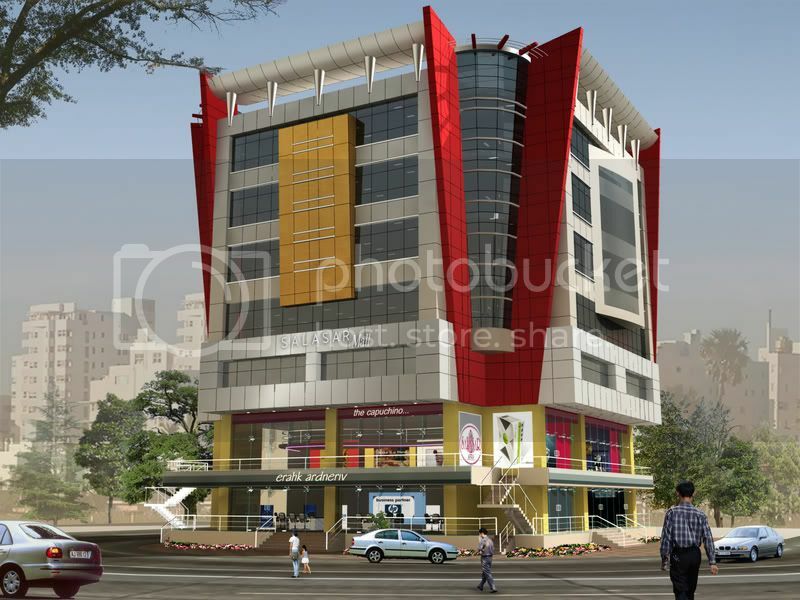 Since the Netaji Market Mall will be located in a crowded locality, the permitted floor to space index (FSI) is 1.25. For the remaining five malls, the FSI is 2.5. Six firms have evinced interest in the Netaji Market mall, ten in water works office, 11 in Gokulpeth, nine in Danaganj, and seven each in Jaripatka and Pachpaoli. While the corporation has laid a broad criteria for the malls, builders can construct hotels, restaurants or multiplexes as long as they do not violate the development control rules (DCR). A number of IT and ITeS companies, which had evinced interest in setting up their base here had complained about lack of adequate infrastructure in terms of shopping areas and the hospitality sector in the city. International agencies, which surveyed the city had also made similar remarks. The corporation expects this to be a thing of the past soon. Nagpur may enter the big league if the plans of Satish Chaturvedi, Maharashtra textile minister and guardian minister for Nagpur district, fructify. At a meeting organised here recently by the Nag-Vidarbha Chamber of Commerce (NVCC), the apex body of traders in the region, the minister spelt out his plans for making Nagpur one of the top three cities in the country. These include gifting the city a sky-rail, several flyovers, a hospital on the lines of AIIMS, five-star hotel, and a new road circumventing the city. According to him, the city would get the country’s first sky railway by 2009. A Swiss company has evinced interest in setting up the system. The company has proposed that it would build the suspended rail system and operate it till it recoups its investment. Thus, the cost to the state would be negligible. The rail line will connect Pardi Naka on one extreme of the city to the Ordnance Factory area on the other side and the company would levy a charge of Re 1 per kilometre for ferrying passengers. After 9 pm, it could be used for ferrying goods, Chaturvedi said. Before that, work on the new flyover above and parallel to Central Avenue would begin. The bridge would start from Vaishno Devi Square, in the busy business district of the city, and end at the road touching the railway station, he said. It is expected that tenders for the project would be floated within a couple of months. With this, those living at the eastern tip of the city would be able to reach the railway station within five to seven minutes against the 45 to 60 minutes it now takes, he added. The Itwari flyover, which was initially planned as a two-laned one, will now be a four-laned bridge and the state government has agreed to provide Rs 10 crore for the project instead of Rs 3 crore allotted earlier. An extra Rs 5 crore has also been secured for the Maskasath bridge. Work has also been expedited to build the cotton market overbridge, said Chaturvedi. An outer ring-road for the city is also being planned. The old ring-road no longer serves the purpose of a circumventing road, as the city has expanded and many areas it touches fall within the municipal limits, he added. A plan has also been chalked out to develop an area 25 km away from the zero milestone where residential colonies or other complexes can come up in plots spread over 100 acres. This can be done in association with the private sector, he said. Textile major, Indo Rama Synthetics (India) Limited, has expressed interest to develop a multi-specialty hospital in the city. The company may be allotted vacant land near Medical College’s TB Ward for the same. In case Indo Rama is not in a position to build the hospital, Reliance is ready to take over the job. The Centre will also be pressed to allot around Rs 400 crore for setting up a referral hospital in the city, which will be akin to AIIMS, he said. Indo Rama officials, when contacted, denied comment. A rail overbridge has also been planned near Mankapur on the road reaching pilgrims to the Koradi Temple. The minister felt that the city’s development would remain incomplete without a five-star hotel. If Nagpur wants to match global standards and be counted in the top three cities of the country, it should have a five-star property. And if there is none, the government will ensure that a five star property comes up here. Chaturvedi announced that he would offer any government land for setting up the hotel and urge leaders in the hospitality sector such as the Taj Group and others to invest here. ah, a neta's syrupy talk is always music to ones ears. The Nagpur Municipal Corporation (NMC) has embarked on a massive technology-driven exercise aimed at collecting data related to the city through Geographical Information System (GIS). Bangalore and Hyderabad are known to be the only two cities in the country to have mapped details using an advanced GIS and now Nagpur will become the first city in Maharashtra and the third in the country to do so. The data will eventually be available to the public through NMC’s website www.enmc.org.in . It will help the civic body appreciate what all it has and where it is losing revenue. For convenience, the civic body has divided the task into two parts: collecting images through satellite and doing field surveys to gather other requisite information. The Maharashtra Remote Sensing Application Centre (MRSAC) is using an American satellite fitted with high resolution cameras for obtaining detailed satellite images. Field work is being done by M/s ADCC Infotech Private Limited and M/s Speck System Limited (Hyderabad). The city has been divided into two zones for the purpose of field survey and each company is in-charge of one zone. NMC is paying Rs 1.5 crore to the companies. He said that using GIS data is being collected on roads, bus shelters, cross drainage, storm water drains, sewer lines, manholes, footpaths, hawker zones, markets, road dividers (median), NMC hoarding sites, parking sites, toilets and urinals, public taps, property (revenue), street lights, traffic islands, transit points, trees, water pipelines, etc. Municipal commissioner Lokesh Chandra is confident that GIS will ensure complete transparency in development works. Duplication in the developmental works will be prevented once this system is in place and help NMC in keeping track of new properties and renovation of existing ones. Once GIS database is available, officials will know when a road is constructed and tarred. This is not possible now. Each and every detail of the property will be available with NMC including zone number, city survey number, plot number, khasra number, mouza number, floor, floor type, owner, occupant’s name and address, building number, type of building, telephone number, water meter number, index number, location, occupancy factor, age factor, date of construction and cost of construction, etc. Last edited by mobarch; December 10th, 2006 at 04:35 PM. Nagpur seems to have appeared simultaneously on the radar screens of many five-star groups as teams from three more chains are understood to have made initial surveys to locate their properties here. Two hotel chains Kamat Group and Radisson Hotels and Resorts have committed investments of Rs 100 crore and Rs 35 crore respectively. Now, Le Meridian, Ginger Hotels of the Tata Group and the Hyatt Group are understood to have sent advance teams to the city to scout for possible locations for their properties. Interestingly, all of them have shown keen interest in land bordering the Wardha Road even as they also looked up some other sites. Builders and property agents said that if any one of them comes up with a firm offer, land rates may shoot up all over again. Already, property rates on Wardha Road are at their zenith and nobody is willing to hazard a guess on how high they could go. Kamat and Radisson’s too have decided on Wardha Road for their respective properties. A four member team from Le Meridian, a company with several five star properties across the country, visited the city recently. Though the amount of investment and the standard of facilities that it is planning to offer, are not known, an industry insider said that the company was planning to start operations here within 18 months. Realty dealers also disclosed that Ginger Hotels, a chain of budget hotels of the Tata Group, visited the city for purchasing a plot, again, on Wardha road. The group, reportedly, failed to zero in on any particular site that could fulfill their needs. Hyatt Group of Hotels too have checked up on the city. Another group of economy hotels, Lemon Tree Hotels, has also shown interest in Nagpur. 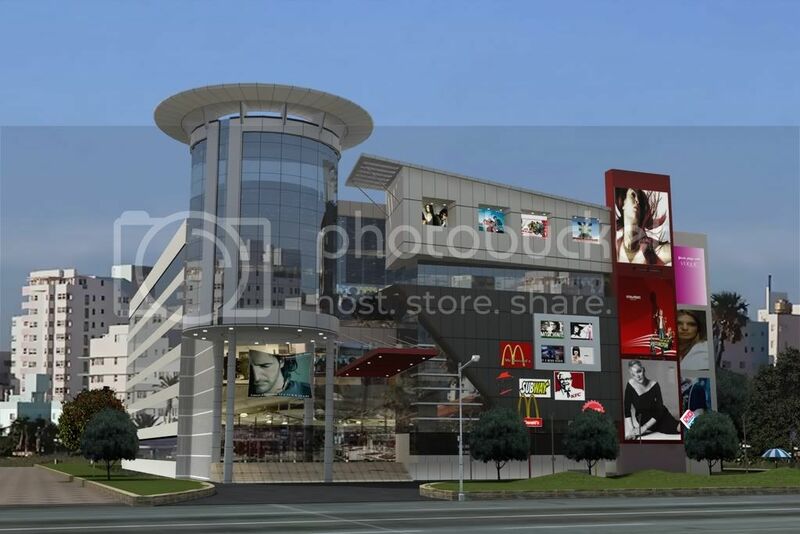 This is the preliminary view of Proposed LGB Mall at Raipur designed at V.K.Associates. Last edited by mobarch; April 13th, 2007 at 07:27 AM. New Delhi, Jan 3. (PTI): The Centre has approved three water supply projects for Nagpur and one for Coimbatore, as part of its Rs 1,00,000-crore Jawaharlal Nehru National Urban Renewal Mission (JNNURM). Sources in the Union Urban Development Ministry said, the Central sanctioning monitoring committee has approved a Rs 62-crore project for water supply from Mahadula to a treatment plant at Godhani and further to the governor's house in Nagpur subject to ring fencing of expenditure. The sanctioned project involved an additional central assistance of Rs 31 crore with Rs 7.74 crore recommended for release as first instalment. The approval came at a recent meeting attended by Urban Development Secretary M Ramachandran and Joint Secretary M Rajamani among others. The monitoring committee also approved phase three and four of another Rs 185-crore water supply project for Nagpur. It sanctioned a Rs 113-crore project aimed at improving the water supply scheme to the Coimbatore corporation on condition that when the city comes up with the next proposal for a water supply project, it should provide for sectoral reforms like water and revenue audit. The city authorities were also asked to ensure ring fencing of both revenue and expenditure while executing the project. The committee recommended release of Rs 5.6 crore as the first instalment of the total additional central assistance of Rs 56.87 crore for the Coimbatore water project, the sources said. mobarch.........................thanks. These are nice projects for Nagpur.